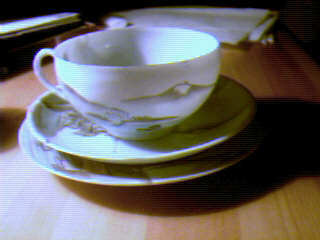 A few years ago I got a Tea set after my late grandgrandmother. She had got it from a cousin who were at sea, in 1909 or 1910. There were once two services in my family, one was sold after the stock market collapse, at 500 DM. My set have survived war and the bombings of Berlin. It would be interesting to know more about it, where it comes from, the value etc. I hope you can help. Very likely your tea set is from Japan and made around 1900. 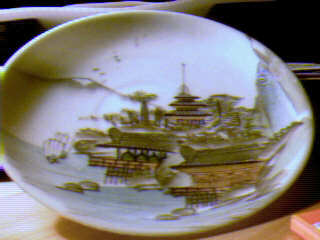 The mark is not exactly right but is still probably the mark of the Fukagawa (Fuka=mountain, gawa=river) Porcelain Manufacturing Company, founded in 1894. The Fukagawa mark are a picture of a mountain and in front of that a small river landscape. 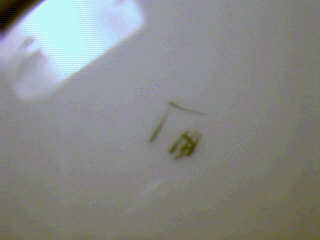 A traditional Fukagawa mark is given to the right. In 1894 one of the Fukagawa brothers who in 1894 run Koransha had been studying ceramic design with the most famous studio potter in Japan, Makuzu Kozan, and wanted to expand sales to foreign markets. 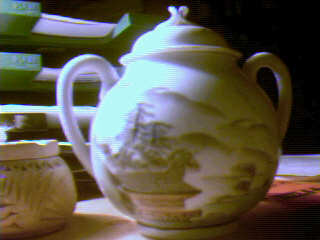 He therefore founded the Fukagawa Porcelain Manufacturing Company and then went on studying European porcelain in an effort to understand the Western taste. The company still exists and are run by a new generation of the Fukagawa family.